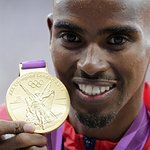 Sir Mo Farah has announced he will play for England in this year’s eagerly anticipated Soccer Aid for UNICEF match on ITV. Set to take centre stage at Old Trafford on Sunday 10th June, four-time Olympic champion Sir Mo Farah will play for his home nation and be on the opposing side of his good friend, and fellow Olympian, Usain Bolt. Rumours of when Mo and Usain would go “head-to-head” have been rife ever since the pair, who are close friends both took part in their final major T&F championships towards the end of last year. Over the coming weeks, the England V Soccer Aid World XI rivalry is set to intensify further, with some of football’s biggest legends and celebrities set to join both Sir Mo Farah and Usain Bolt in the growing line-ups. With two Olympians now confirmed to be on the pitch, this year’s Soccer Aid for Unicef match is going to be a game like no other. The international friendly match will take place at Old Trafford on Sunday 10th June, just four days before the FIFA World Cup in Russia begins. Tickets are on sale now and the game will be broadcast live on ITV. Kick-off scheduled for 20:00 BST. Soccer Aid for Unicef is the original England V Soccer Aid World XI charity match. It was launched and co-founded in 2006 by Unicef UK Ambassador Robbie Williams and Jonathan Wilkes, and has previously featured A-list stars such as Will Ferrell, Woody Harrelson, Mike Myers and Niall Horan, plus footballing royalty including Diego Maradona, Zinedine Zidane, Luis Figo and Ronaldinho. Soccer Aid for Unicef 2018 is set to be bigger and better than ever. Unicef, the world’s leading organisation for children, has joined forces with ITV to make the pro-celebrity football match bigger and better than ever, with more potential to raise money and vital support for children in danger. Soccer Aid for Unicef is produced by Initial, part of Endemol Shine UK, for ITV. 100% of all public donations to Soccer Aid for Unicef will go towards supporting the vital work protecting children in the UK and globally. The money raised through profits from ticket sales and viewer donations during the match will add to the incredible £24 million that has already been raised through Soccer Aid over the last 12 years. Tickets for the Soccer Aid for Unicef football match on Sunday 10th June 2018 at Old Trafford are available now at www.manutd.com/socceraid or by calling 0161 444 2018 with tickets priced between £10 and £50.